Enjoy a meal at the restaurant, or stay in and take advantage of the hotel's room service (during limited hours). Buffet breakfasts are available daily from 7 AM to 10:30 AM for a fee. Make yourself at home in one of the 29 guestrooms. Complimentary wireless Internet access is available to keep you connected. Bathrooms have showers and complimentary toiletries. Housekeeping is provided daily, and irons/ironing boards can be requested. Offering a sun terrace with an outdoor swimming pool, a thatched rooftop terrace with ocean views and free Wi-Fi throughout, Aventura Pacífico is 2 minutes’ walk from Bucerías Beach. The boutique-style accommodations offer air conditioning, ceiling fan, cable TV and a private bathroom with shower. The suites also feature a seating area, private entrance and a kitchenette with dining area, coffee maker, stove and fridge. Guests will find a variety of food places and convenience stores 5 minutes’ walk away. The restaurants and shops at Bucerías Town Centre in the Golden Zone are 15 minutes’ walk from the hotel. 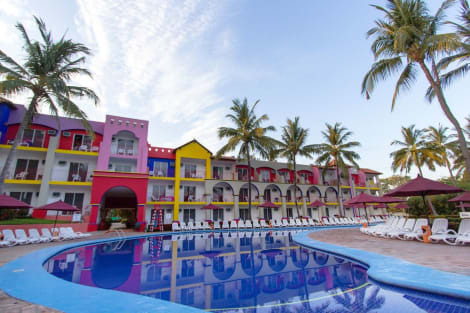 Aventura Pacífico is 20 minutes’ drive from the Puerto Vallarta International Airport and from the Puerto Vallarta Town Centre and its art galleries, nightlife and seafront. Whale watching and water sports can be arranged as well. Pamper yourself with a visit to the spa, which offers massages. You're sure to appreciate the recreational amenities, which include 4 outdoor swimming pools, a steam room, and a fitness center. This property also features complimentary wireless Internet access, concierge services, and gift shops/newsstands. lastminute.com has a fantastic range of hotels in Bucerias, with everything from cheap hotels to luxurious five star accommodation available. We like to live up to our last minute name so remember you can book any one of our excellent Bucerias hotels up until midnight and stay the same night.